Help an orphaned child avoid being returned to a sadistic caretaker. None; however, Delayed Burial is an optional prequel to this quest. Speak to Aventus Aretino inside the Aretino Residence in Windhelm. Kill Grelod the Kind in the Honorhall Orphanage in Riften. Return to Aventus for your reward. It seems a strange boy named Aventus Aretino is all the talk in Windhelm. 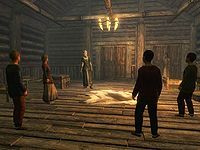 By asking around town you will likely hear that Aventus is attempting to perform the Black Sacrament, a ritual designed to summon a Dark Brotherhood assassin. Once this topic arises in a dialogue, the objective "Talk to Aventus Aretino" will appear in your journal as a miscellaneous quest. Speaking to the children at Honorhall Orphanage in Riften will also lead you to Aventus' door. 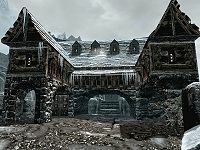 You will find Aventus in the Aretino Residence in Windhelm. If entering Windhelm through the main gate, immediately turn right and proceed up the stairs. Continue straight ahead, passing the house on your left, and turn left around its far corner. You should now be heading north, with the house on your left and a crumbling stone wall on your right. The Aretino Residence is a short distance ahead. If this is your first visit to the area, Idesa Sadri will be outside Aventus' house trying to dissuade Grimvar Cruel-Sea from playing with poor Aventus, warning him that, "...Aventus Aretino walks a dark path". If you have previously entered the house without the objective in your journal, it will be added at this point. To speak with Aventus, pick the lock on the door where you will discover Aventus performing the Black Sacrament, chanting over and over again. He is so engrossed in the ritual that he fails to notice you. When you speak to him, he will be overjoyed and mistake you for the assassin he was trying to summon, "I did the Black Sacrament, over and over. With the body, and the... the things. And then you came! An assassin from the Dark Brotherhood!" He will tell you about his mother's death and that afterward he was sent to Honorhall Orphanage in Riften, where he was subjected to the cruelties of its headmistress, Grelod the Kind. He escaped the orphanage and returned to his home where he set about performing the Sacrament to get his revenge and to ensure that neither he or his friends will have to suffer any more. He expects you to kill Grelod, further stating, "She's a monster." You can ask for further details, but whatever the course of your conversation with him, it will conclude with your journal advancing the Innocence Lost quest. Travel to Honorhall Orphanage in Riften. Here Grelod the Kind is a cruel tyrant, verbally abusing her charges, "Nobody needs you, nobody wants you", and that her nickname is a term of endearment that she has bestowed on herself and imposed on the children. Killing Grelod does not constitute a crime so you may kill her in whatever fashion you see fit, however attacking any of the children or Constance Michel is a crime. Whatever manner you choose will be successful as she only has one point of health. While Constance, Grelod's employee, runs about in a panic once Grelod dies, the orphans will come to gloat over the body, expressing reactions ranging from philosophical reflection, "Kill one person, and you can solve so many problems. I wonder at the possibilities", to simple joy, "Hurrah! Hurrah!" If spoken to, each of the children will share one or more thoughts and feelings about her death. Return to Windhelm and speak to Aventus. He will greet the news with happiness and show his gratitude by giving you a family heirloom, which is "Supposed to be sort of valuable", however the dinner plate is only worth 100 gold. This quest counts as a favor quest for Aventus, who is a citizen of Eastmarch. If you have killed Grelod prior to starting the quest, then when you speak with Aventus for the first time you can tell him that you killed her. He will state that "I knew the Dark Brotherhood was good... just not that good! You killed the old hag before I even asked!" There are no negative consequences to the quest and the reward is the same. If you revisit the orphanage after completing the quest, the children will make general comments about things being better with Grelod gone. After killing her, guards may say "Been a murder, over in Riften. Some old lady who runs an orphanage. Those poor children must be heartbroken." 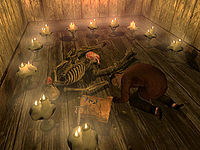 Guards in Riften may also suggest some suspicion toward you with "That old woman who runs the orphanage has been murdered. Say, didn't I see you coming out of there...?" If Serana is your follower during the quest, she will perform The Black Sacrament at the Arentino residence. When entering Honorhall orphanage she will comment "I don't like the feeling of this place." After Grelod is killed, Constance Michel will run around in a panic. She will remain in this state even if you return days or weeks later, only returning to normal once Innocence Lost has been completed by speaking to Aventus Aretino. Although you will note in your journal that Aventus can return to the orphanage at the completion of the quest, he never does so. He will remain alone in his home. If spoken to there, he will say that he's planning on growing up to be an assassin, "like you". If you talk to him right after killing Grelod, he will say "I'll give them some time to clean up the mess." Even if you kill Grelod in another room, her body may teleport to the main room upon death. 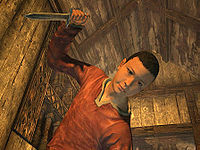 5 I heard a rumor that a boy named Aventus Aretino, in Windhelm, has been attempting to contact the Dark Brotherhood. I should find this boy and speak with him, and find out why he wants to contact a guild of assassins. 20 The mother of Aventus Aretino recently died, and the boy was sent to live at Honorhall Orphanage in Riften. He thinks I'm a Dark Brotherhood assassin, and wants me to kill the Orphanage's sadistic headmistress, Grelod the Kind. 200 Finishes quest I killed Grelod the Kind, and Aventus Aretino rewarded me with a family heirloom. Now the boy can return to Honorhall Orphanage, and live out his childhood peacefully. On the PC, it is possible to use the console to advance through the quest by entering setstage DB01 stage, where stage is the number of the stage you wish to complete. It is not possible to un-complete (i.e. go back) quest stages, but it is possible to clear all stages of the quest using resetquest DB01. This page was last modified on 30 March 2019, at 20:43.